0.5 Litres per second against discharge head of up to 12m, and with a suction lift not exceeding 7.5m. 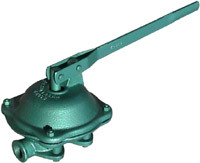 Suction – screwed 25NB (1″ BSP) female. Discharge – scrwed 20NB (3/4″ BSP) female.